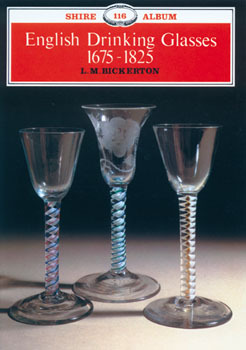 This book traces the complete history and illustrates the variety of English drinking glasses from 1675-1825. It covers all types of glasses, from the heavy balusters of before 1700 to the faceted stems of around 1800 which are so sought after by collectors. It is superbly illustrated with countless clear black & white photos of glasses, each with an detailed description. This book also features informative sections on faceted and rudimentary stems, moulding and cutting, air and cotton twists, and many more. This excellent new book is a must for both glass collectors and dealers, as well as anyone interested in glass in general.